Archeological work at the Hudson Quarter development, on Toft Green, has unearthed historic remains of York’s previous railway station. 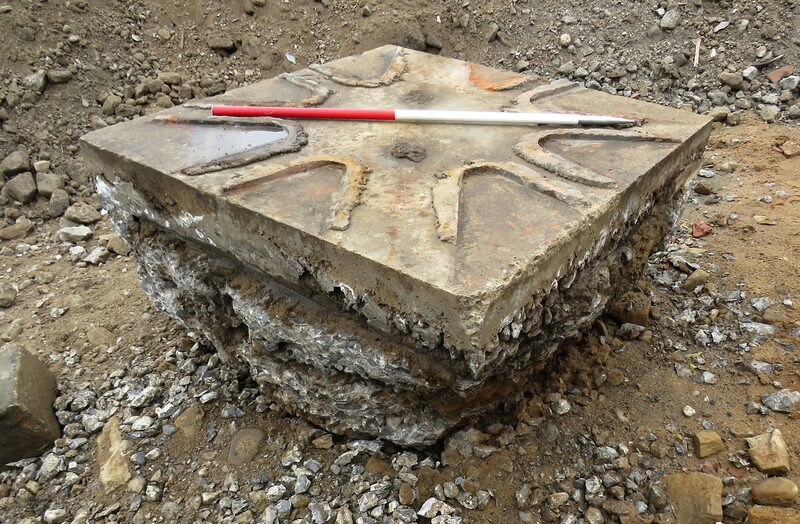 An old train turntable has been excavated from the site and will be included in the new Hudson Quarter landscaping plans, in a nod to the railway heritage at the site, which is being developed by Palace Capital PLC. The first railway station in York was a wooden structure on Queen Street and the first tracks went through the Hudson Quarter site. The station was superseded by the current railway station in 1877. Structural evidence of the old station’s platforms, train turntables, auxiliary buildings and associated drainage systems were preserved amongst the piling and foundation beams belonging to Hudson House. Working alongside Squibb Demolition, LS Archaeology oversaw the removal of modern build up layers until the archaeological level was reached allowing the remains of this historic railway to be recorded and planned. The original station was devised by ‘The Railway King’ George Hudson designed by George Townsend Andrews and engineered by the ‘Father of Railways’ George Stephenson. Caddick Construction is the main contractor and work is on set to be completed by 2021. Neil Sinclair, CEO of Palace Capital PLC commented: “The archeological work on the site has been very important to us, as we were very aware of the significant location of the site. “We are very excited at the prospect of incorporating the turntable into the Hudson Quarter landscape for future generations to enjoy. It will be a fitting reminder of the site’s rich railway history.” Caddick Construction, as the appointed contractors of Palace Capital the owners of the two-acre site on Toft Green, has just started on site to develop 127 luxury apartments, 34,500 sq ft of Grade-A office space and 5,000 sq ft of other commercial uses, located in four buildings around a landscaped central area.